Wow, what a great idea, you were very creative today Terri :) I love rhinestones with ribbon, and your ribbon roses are just beautiful! I love the challenges for the same reason, but have had to stop them for a while due to other commitments, hope to get back into it again soon. Absolutely stunning and magical, fit for a Queen Terri! OH MY, This is really beautiful!!! Well it certainly looks like something Marie Antoinette kept in a dainty little jewel box in her boudoir. Perhaps a gift from an admirer? Terri- I meant to leave you a comment to tell you I had posted your charms, but I moved a little too slow. 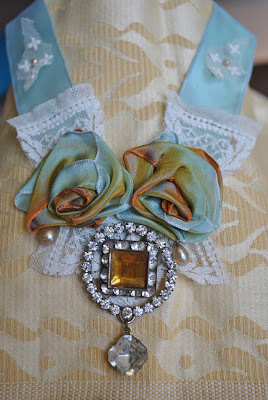 This necklace is incredible and perfect for the Marie necklace swap. I loved you post about "so what, do it anyway." I can so relate to sleepless nights right now. Having a lot of trauma here. Art keeps me sane, but eventually my worries stifle my art, and then I do nothing, and then depression can set in easily. Just trying to plug along, so your posts and art were inspiring tonight when I visited. I think this is the prettiest necklace ever! This is the most beautiful necklace I have ever seen, love everything about it. Ohh this is so beautiful!! I love the name of your blog. I too feel in the last year I have been given affirmations of living an artful life. I turn 50 next month and have felt my little projects and my new job are affirmations that I took the right path this year. Being creative helps me to stay positive. I love your latest creations! Wow, this is beautiful!! love the flowers and your colourcombination!! Wow what a lovely creation, beautiful colours and a very pretty necklace, wonderful work and great idea for this weeks theme!!! Holy Cow, Batgirl, I wanna come live in your craft room. 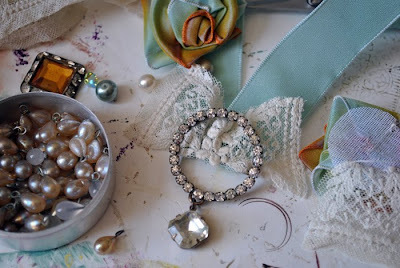 I see a fantastic artist here creating to die for jewelry! Very beautiful Terri - I love the roses - did you make them yourself? Gorgeous colours! Oh Terri..that is stunning! I just want to keep looking at it!! Thank you all! You are so very kind! I want to make more of these. I think they would make nice Christimas gifts. Marlynn, I love my craft room. Last time my sister was in it she asked me if I had a will! Barbara, yes I did make the roses. I am enjoying buying beautiful ribbon and learning how to make better and better roses. Thank you again, all of you, for stopping by and for your encouragement! Thank you so much Kristin! I am flattered!